Will your college football team win a conference title in 2016? Which teams will win the Power 5 conferences, giving them the inside track towards a College Football Playoff berth? Unlike the typical college football publication, I won’t pick a single team to win each conference. Every team has some chance to win, even Kansas, and modern sports analytics can assign each team a conference win probability. These numbers come from my preseason college football model, which considers team performance over the past four years, turnovers and returning starters to rank all 128 FBS teams. This model predicted the winner in 73.3% of games last season, a win rate that only includes games with two FBS teams. This preseason model gives a win probability for each game this season, and these numbers drive my win total predictions at The Power Rank. These win probabilities also provide the parameters for simulating each conference 10,000 times with random numbers. Each simulation determines the division winners through tiebreakers, and then flips another coin to determine the outcome of the championship game. These simulations give the win probabilities below, which I compare with the market odds from Bovada. 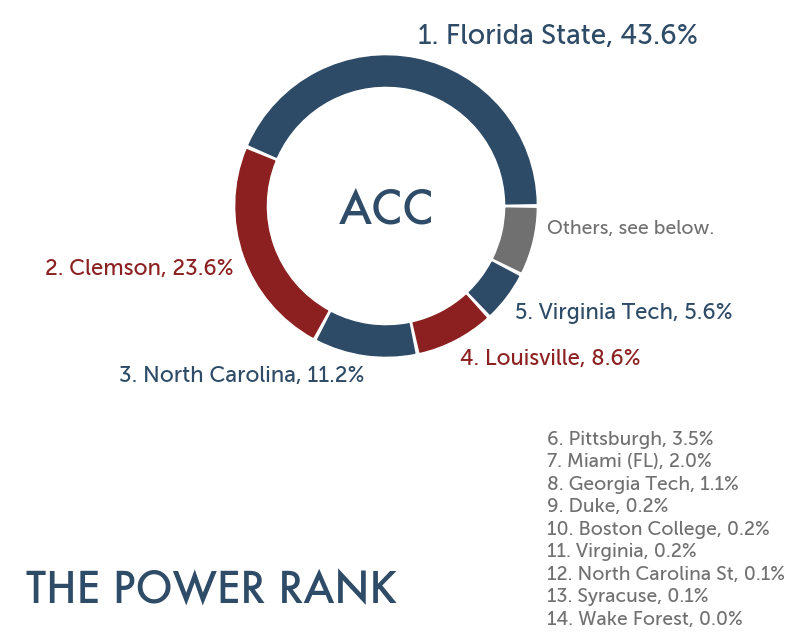 Let’s look at the numbers and story lines for each Power 5 conference. 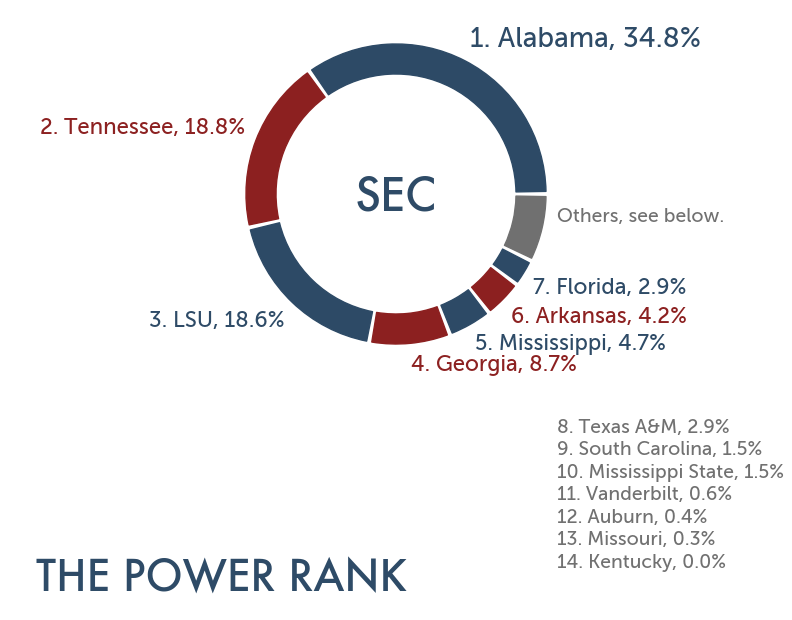 Is Tennessee the new beast in the SEC East? Despite 4 losses last season, Tennessee played close games with Alabama and Oklahoma and never lost by more than a touchdown. The Vols finished last season 8th in my team rankings, which take margin of victory in games and adjusts for strength of schedule. This season, Tennessee should fully see the fruits of strong classes Butch Jones recruited in 2014 and 2015. My preseason model ranks the Vols 7th and gives them a 44.8% chance to win the East despite a difficult cross division game with Alabama. Tennessee’s strong chances to win the East reflect poorly on the other programs in the division. Georgia hired a coach (Kirby Smart) who has never been a head coach. Florida looked on the rise last season under Jim McElwain before getting demoralized by Florida State, Alabama and Michigan to end the season. Steve Spurrier left South Carolina mid-season, and the Gamecocks replaced him with Will Muschamp, who never got the job done in four years at Florida. Missouri won the SEC East in 2013 and 2014 but appear in rebuilding mode after the retirement of Gary Pinkel. My model doesn’t like the prospects of these usual contenders for the SEC East crown, which enhances the odds for Tennessee. The story changes if Tennessee played in the SEC West. My numbers rank Ole Miss right behind Tennessee at 8th in the nation. However, with Alabama (#1) and LSU (#3) ahead of them, Ole Miss has a 8.7% chance to win the division. The lack of power balance also favors Tennessee in the overall conference odds. My preseason model would make LSU a 2.5 point favorite over Tennessee in the SEC title game. However, because they play in a weaker division, Tennessee has a better probability of winning the SEC than LSU. Tennessee (#7) has a 44.8% chance to win. Georgia (#16) has a 28.4% chance to win. Florida (#28) has a 12.2% chance to win. South Carolina (#34) has a 8.0% chance to win. Vanderbilt (#44) has a 4.0% chance to win. Missouri (#52) has a 2.2% chance to win. Kentucky (#83) has a 0.3% chance to win. Alabama (#1) has a 45.1% chance to win. LSU (#3) has a 27.7% chance to win. Mississippi (#8) has a 8.7% chance to win. Arkansas (#12) has a 8.3% chance to win. Texas A&M (#10) has a 5.6% chance to win. Mississippi State (#23) has a 3.5% chance to win. Auburn (#32) has a 1.1% chance to win. A year ago, Ohio State was the toast of college football. Urban Meyer’s team had won the first playoff, and he was killing it as usual on the recruiting trail. In contrast, Michigan had many unanswered questions a year ago. They went 5-7 the previous season, and their hopes for 2015 rested on their faith in new coach Jim Harbaugh. Michigan had a few rough spots in 2015, including a demoralizing 42-13 home loss to Ohio State. However, they finished 10-3 after a convincing win over Florida in a bowl game, and Harbaugh landed a top 5 recruiting class in February. How do Ohio State and Michigan compare in 2016? My numbers imply a dead heat between Ohio State and Michigan in 2016. Michigan (#9) is ranked ahead of Ohio State (#11) but would be a 2.5 point underdog when they travel to Columbus in November. However, Michigan does have a better chance to win the Big Ten East (37.8% vs 34.9% for Ohio State) due to an kinder cross division schedule. Both teams play Wisconsin, but Michigan gets Iowa (#36) and Illinois (#88) while Ohio State tangles with Nebraska (#25) and Northwestern (#58). In the Big Ten West, it might seem strange to that Nebraska has the highest conference win probability. However, the Huskers went 1-5 in games decided by a touchdown or less, which included a loss to BYU on a Hail Mary. A turnover margin of -12 didn’t help either. Luckily for Nebraska, my research shows that their record in close games and turnover margin most likely improve in 2016. QB Tommy Armstrong returns, and Nebraska could be really good if they can fix their porous pass defense. However, the real reason Nebraska has the highest odds to win the Big Ten West is Wisconsin’s schedule. After two years of playing Rutgers and Maryland in cross division games, the Badgers get Ohio State, Michigan and Michigan State. Nebraska also plays Ohio State but gets Indiana and Maryland. Advantage Nebraska. 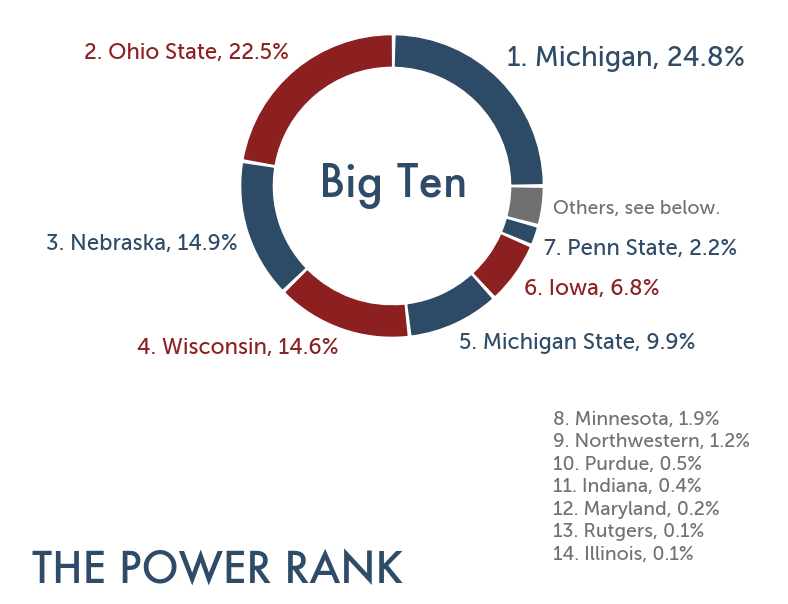 And I guess we should discuss defending Big Ten West champion Iowa. The Hawkeyes had a magical season last year, but quickly regressed in the Rose Bowl against Stanford. My numbers give them a 19.3% chance to win the division, much less than the even odds in the markets. Michigan (#9) has a 37.8% chance to win. Ohio State (#11) has a 34.9% chance to win. Michigan State (#29) has a 19.0% chance to win. Penn State (#43) has a 5.7% chance to win. Indiana (#67) has a 1.4% chance to win. Maryland (#78) has a 0.7% chance to win. Rutgers (#84) has a 0.5% chance to win. Nebraska (#25) has a 34.2% chance to win. Wisconsin (#22) has a 31.1% chance to win. Iowa (#36) has a 19.3% chance to win. Minnesota (#60) has a 7.7% chance to win. Northwestern (#58) has a 4.8% chance to win. Purdue (#76) has a 2.5% chance to win. Illinois (#88) has a 0.5% chance to win. My numbers understand some of the hype surrounding the Washington Huskies. They return 15 starters from last season, including 7 players on a defense that ranked 9th by my adjusted yards per play. The subjective adjustments also seem to favor Washington, as QB Jake Browning returns as a sophomore after a promising freshman season. Coach Chris Petersen enters his third year and might find the same success he had at Boise State. But it’s pure insanity to make Washington the Pac-12 favorite, as the markets have them in early August. While Washington showed promise last season, they finished 7-6 and 31st in my team rankings that take margin of victory and adjust for schedule. Not exactly playoff material. Last season, Washington had one signature win, a 17-12 win at USC. However, it almost doesn’t count, as USC coach Steve Sarkesian got fired the next week and possibly wasn’t sober while preparing for the Huskies. Washington has yet to prove itself on the field, which makes it difficult to think they’ll win the Pac-12 North over proven teams. Stanford has to replace their QB and fill holes on both lines, but they still have this guy named Christian McCaffrey. Even though they’re replacing the quarterback, Oregon has most of its weapons back on offense. And the defense can’t get worse, can it? 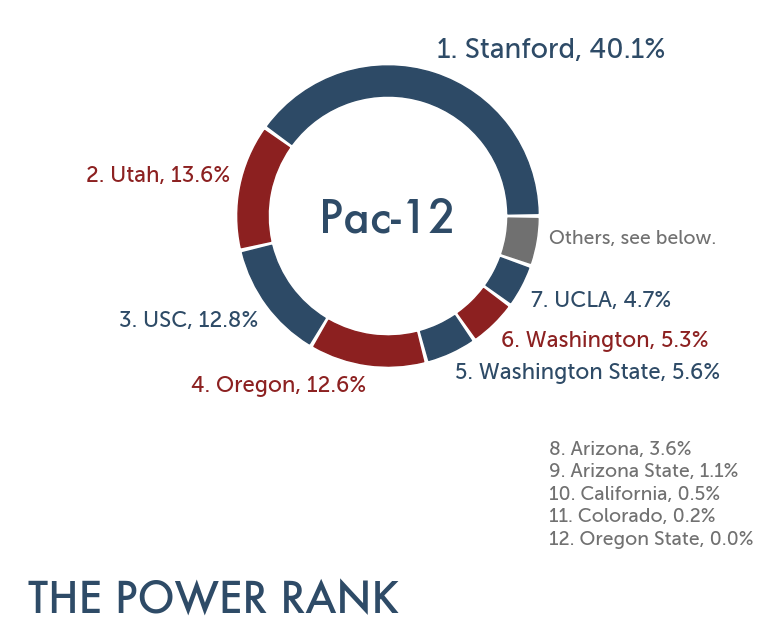 My numbers like Stanford (35.8%) and Oregon (21.4%) over Washington (10.1%) to win the Pac-12 North. In the Pac-12 South, the odds makers might be overlooking Utah. It’s not just that Kyle Whittingham has the Utes back on the rise with stellar play on defense. It’s the schedule. When the Pac-12 split into two divisions, UCLA and USC wanted to keep their rivalries with Stanford and California. However, this has implied a more difficult schedule for all four of these teams. USC gets the worst of it this season, as they not only play their two northern California rivals but also Oregon. The Trojans always have talent. However, Clay Helton went an uninspiring 5-4 as interim head coach last season, so there’s reason to doubt his ability to get this talent to play at a championship level. UCLA catches a break in getting Oregon State as their third cross division game. In addition, I think my numbers underestimate Jim Mora’s team this year. My preseason rankings are based on their team rank of 41st last season, but this seems inconsistent with an offense and defense that ranked 27th and 14th last season by my adjusted yards per play. My numbers make Utah the favorite in the Pac-12 South because they play Oregon State, California and Oregon in cross division games. If the offense can get better with new personnel, Utah could become a legitimate Pac-12 contender. Stanford (#6) has a 55.1% chance to win. Oregon (#18) has a 21.4% chance to win. Washington State (#30) has a 11.8% chance to win. Washington (#26) has a 10.1% chance to win. California (#56) has a 1.5% chance to win. Oregon State (#87) has a 0.1% chance to win. Utah (#24) has a 35.8% chance to win. USC (#19) has a 29.9% chance to win. UCLA (#37) has a 15.9% chance to win. Arizona (#38) has a 12.3% chance to win. Arizona State (#53) has a 4.9% chance to win. Colorado (#77) has a 1.3% chance to win. It seems like Clemson should win the ACC over Florida State in 2016. Florida State has 17 returning starters, which includes star running back Dalvin Cook. In contrast, Clemson returns only 12 starters. The Tigers also had heavy attrition in the secondary, including 3 players that got drafted by the NFL. In addition, while Clemson beat Florida State by 10 last year, it was a closer game than the final score indicated. Florida State had more yards per play than Clemson. The Seminoles couldn’t overcome a 2 for 12 rate in converting third downs. In the Coastal division, the markets have the same odds for Miami as for defending champion North Carolina. This shows major respect for new Hurricane coach Mark Richt, who won 145 games in 15 season at Georgia. My numbers, which do not consider the coaching change, give Miami the fourth largest win probability for the Coastal division. Florida State (#2) has a 53.3% chance to win. Clemson (#4) has a 31.3% chance to win. Louisville (#14) has a 13.9% chance to win. Boston College (#55) has a 0.6% chance to win. North Carolina State (#59) has a 0.4% chance to win. Syracuse (#64) has a 0.4% chance to win. Wake Forest (#73) has a 0.2% chance to win. North Carolina (#20) has a 37.3% chance to win. Virginia Tech (#31) has a 25.0% chance to win. Pittsburgh (#33) has a 16.4% chance to win. Miami (FL) (#40) has a 10.2% chance to win. Georgia Tech (#47) has a 6.7% chance to win. Duke (#75) has a 2.3% chance to win. Virginia (#72) has a 2.1% chance to win. 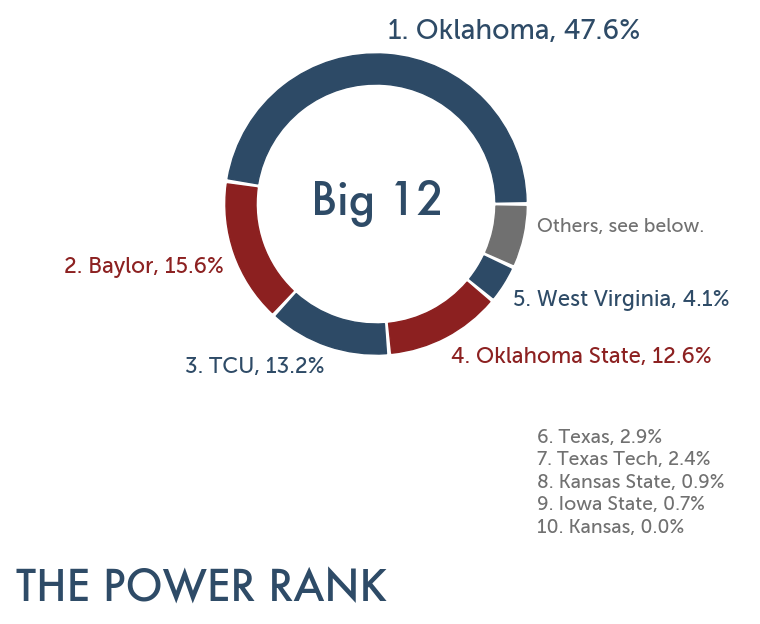 Can any team topple Oklahoma from the top of the Big 12? Bob Stoops has had consistent success as coach at Oklahoma. Only once in his 17 years have the Sooners finished the season outside the top 25 in my team rankings (2005). Stoops has had his bad years. In 2014, Oklahoma went 1-3 in games decided by a touchdown or less and had an 8-5 record. However, despite an embarrassing bowl loss to Clemson, they still finished 15th in my team rankings. My preseason model that looks over the past four years appreciates this type of consistency, and it ranks Oklahoma 5th. They could slip like they did in 2014. But with QB Baker Mayfield back, don’t count on it. The Big 12 win probabilities do not consider the departure of Baylor coach Art Briles. There should be some type of adjustment downward for the Bears. They have one starter returning on both the offense and defensive lines, which suggests they might regress even with Briles as coach. The team most likely push Oklahoma is TCU. Gary Patterson had the 17th ranked defense by my adjusted yards per play despite a rash of season ending injuries. With the return of a few of these players, who do not count towards the number of returning starters, TCU’s defense should be elite. On offense, TCU lost almost all of their skill players on offense. However, they will reload with Texas A&M transfer Kenny Hill at quarterback. How many conferences will my numbers get right? The Power Rank’s preseason model predicted the game winner in 73.3% of games in 2015. Despite appearances, it is possible to make accurate game by game college football predictions right now. However, that doesn’t imply we know which teams will win their conferences with any certainty. Teams play a small sample size of 8 or 9 games to determine a champion, which provides an opportunity for teams to steal a conference title. It only takes one game. In 2015, Michigan State traveled to Ohio State without QB Connor Cook. The markets made the Spartans more than a two touchdown underdog. Michigan State won the game anyway, and this one loss eliminated Ohio State from Big Ten title contention. For the Power 5 conferences, no team has better than a 50% chance to win their conference by my numbers. Oklahoma has the highest odds at 47.6%, a number that could be higher because of the coaching changes at Baylor. This means that if three of my predicted champions actually win, I would have benefitted from some good fortune in making my predictions. This leaves plenty of room for surprise teams to make a run at the College Football Playoff, just like Michigan State in 2015.